Weekly Planner Template: 15 FREE Brilliant Designs! Free Weekly Planner Templates: 15 Beautiful Designs! In need of a weekly planner template? It’s another happy day today on the blog because I am sharing my go-to planner of choice: the printable weekly planners! Whether you’ve been using this kind of planner for a long time already or just starting out, I am pretty sure you’ll love the refreshing designs that I am about to give away. I have here 15 beautiful free printable weekly planners in full floral blooms! Calling every busy lady out there, scroll down to see this lovely gift from me that will help you ease stress and improve weekly productivity immensely! Let me ask you a few questions first: Was there ever a time in your life that you wish you had done more in the past week so you won’t be as loaded as the current week? Was there ever a time that you wished your week was longer so you can do more? If you’ve just answered yes, I’ve got some help for you. Yup, it’s that simple. Mindfully and intentionally planning your week ahead will do wonders in your life. It will greatly help you keep your focus. With planning, you will feel more accomplished, organized, confident and productive. Ready to set sail your weekly plans with me? You will be needing a printable weekly planner template like the ones I have here. Friends, it’s time to pick your printable weekly planner! First, you will have to decide the design and layout of the weekly planner template that you think can work best for you. I have created 15 printable weekly planners for you to choose from! Focus on the core layout and think about what planer system you’re comfortable with. Here’s closer look to some of the pages I included. Will you be able to make beautiful plans with these brilliant free printable weekly planners? Weekly Focus Sheet where you can write your priorities for the week. Blissful Week Planner where you can blissfully plan out your life by focusing more on what makes you happy. Productive Week Planner where you can map out your plans to be more productive. Week at a Glance Page where you can write your daily tasks that will give you an overview of how your week will run. Weekly Action Plan Page where you can write your action plans. I like to call them action plans because they push me harder to get them done. Weekday and Weekend Planner where you can plan out your week! The next thing to do after choosing the planner layout to use is to designate a planning day. If you’d like to ask my schedule for this, I do my weekly planning on a Monday. I used to have it on Sundays but because it’s a family day, I can’t really thoroughly lay down my plans. I don’t like planning haphazardly so I had to move my planning days on Monday mornings, just when my husband is already at work and my kid is already in school. How about you? What day do you think can work best for you to write your weekly plans? Commit to planning at least one day every week and make it a habit! It’s planning time! Use the free weekly planners that I am about to share to write down your weekly tasks. Here are a few ideas that you can write in the weekly planning template that I have created for you. Set your priorities for the week. Plan out your weekly meal for breakfast, lunch and dinner. Write your weekly budget and shopping list. Make a list of to-do’s. Enter important events in the planner such as the meetings you should be attending and even parties and birthdays that you shouldn’t forget! Organize your week at a glance. Move any pending tasks to the following week. While I love all the 15 weekly planning pages that I included in the set, the one above is my favorite of them all. It’s the perfect planner to use that eases me in my every day blogging schedule. It allows me to write my daily blogging tasks. You can definitely use this free planner template to ease you in your work, too! It will help you keep your focus all week-long! Do you think they will work for you, too? Looking for more planners to get you organized? You might like to check out the new planner released on the blog, the Back to Basics Binder. It’ a is a one-stop organizing planner fully packed with 25 solid basic organizers to help you successfully manage your time, work, resources, and family. View the binder here. Going back to the free printable weekly planners, how do you find them so far? They can help you organize your week, right? If you think you can use the free weekly planner template printables featured in this post, grab the files HERE! They are designed to be printed in sized 8.5″ x 11″ paper, Okay? By the way, I have incorporated graphic elements by Aura in designing these planners! And oh, if you love the freebies, please take a second to pin the topmost image on Pinterest for others to find us! Thank you! One last thing! 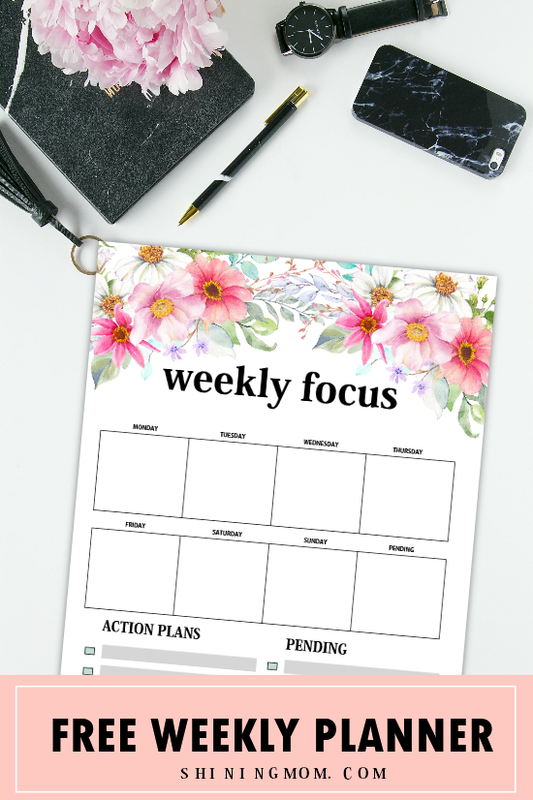 Do I have a reader here who would also like to get the plain version (not floral) of this free weekly planner template set? Let’s see if I can get 20 requests so I can update the post with another one! Let me know at the comments should you like to have the dusty pink and powder blue weekly planner editions! Every request counts. Happy planning every one and may you have an awesome week ahead! Love your work! A dusty Blue would be lovely! Dusty blue is a great idea also – thanks much . Dusty blue and plain woukd be lovely. Hi, I’m Khaye! Welcome to Shining Mom! Come along as we celebrate motherhood. May we savor this time and relish this gift. Together, let us enjoy the little things and emerge as better moms! 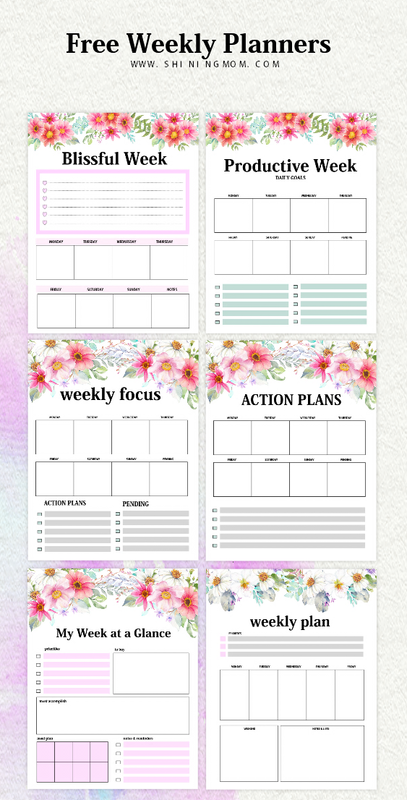 And oh, enjoy the printable organizers that I created for you! NEW! The Best FREE 2019 Planner! For Best School Year Ever! Sign up to get your free "Success Workbook" and receive updates on the newest freebies available, straight into your inbox! I'd love to hear from you. You may reach me at khaye@shiningmomblog.com! Top 30 Free 2019 Printable Calendar Planners: Awesome Designs! FREE Printable 2019 Monthly Calendar and Planner in Florals! FREE Printable Budget Planner 2019: 30+ Budget Templates! 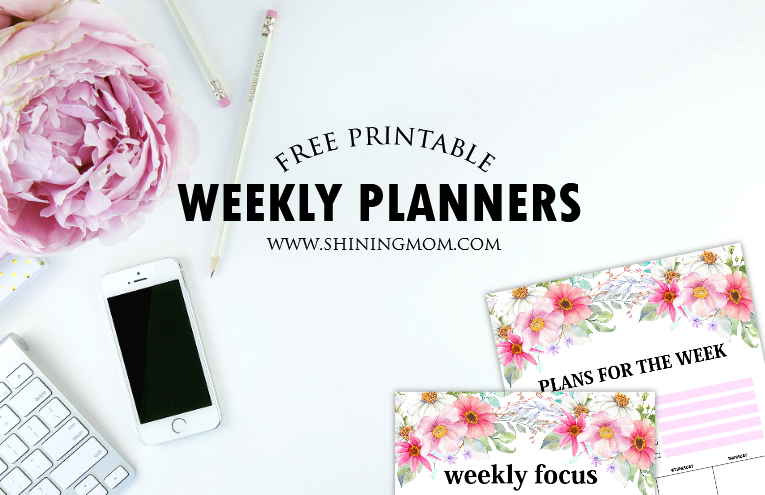 Free Monthly Calendar 2019 and Life Planner in Florals! Free Printable Student Binder: Over 25 Excellent Planning Pages!